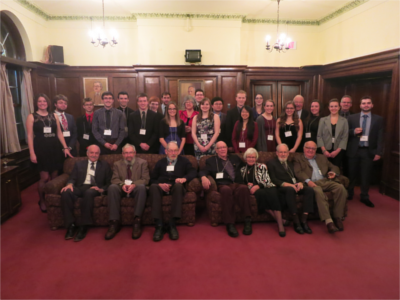 Current and past Beaverbrook Scholars gathered for their annual dinner last week at UNB’s Lady Beaverbrook residence in Fredericton. Since 1920, the Beaverbrook Scholarships have been awarded at the University of New Brunswick, a program initiated by Lord Beaverbrook to help shape future leaders. The Beaverbrook Scholars are a strong network of academics whose leadership and scholastic abilities have helped institute important advancements in many local, provincial and national sectors. Past Beaverbrook Scholars include UNB Chancellor Emeritus Dr. Richard Currie, the former chair of the board of directors for Bell Canada; Dr. Frank McKenna, former New Brunswick premier and deputy chair of the TD Bank Group; and Dr. Jeanne McNeill, who was named New Brunswick's 2013 Family Physician of the Year. Congratulations and welcome to the newest Beaverbrook Scholars!